Many Christians are frustrated with their Christian lives. They want to move forward; they want to do more; but they feel like they are stuck. Why? Some old habit or some old hang-up or some old sin keeps them from going further. God never leaves a job half done. There is something in the gospel message that has the power to set us free. Romans 6:14-18 14For sin shall not have dominion over you, for you are not under law but under grace. 15What then? Shall we sin because we are not under law but under grace? Certainly not! 16Do you not know that to whom you present yourselves slaves to obey, you are that one’s slaves whom you obey, whether of sin leading to death, or of obedience leading to righteousness? 17But God be thanked that though you were slaves of sin, yet you obeyed from the heart that form of doctrine to which you were delivered. 18And having been set free from sin, you became slaves of righteousness. Overall Background: One of the greatest truths of Christianity is the fact that Jesus came not only to forgive us for our sins but also to set us free from the power/control of sin. We are no longer slaves of sin. We are free. Yet many Christians have never experienced this freedom. They are still chained to the same old habit, hang-up, and sin that they had before they got saved. But God’s Word promises in Romans 6:18 “And having been set free from sin, you became slaves of righteousness.” Not only free from sin but you are chained to doing good. This morning, can you say that? “I’ve been set free and I am a slave of righteousness.” If not, this message is for you. 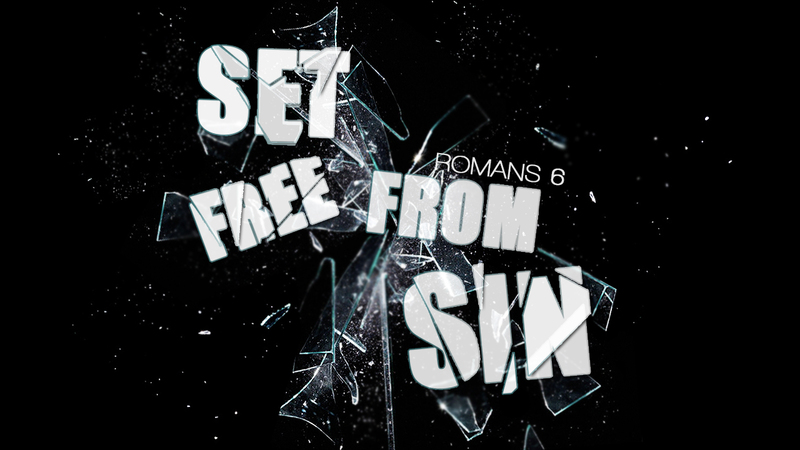 How can you be set free from sin? Paul through the Holy Spirit is going to tell us just 2 things on this matter. I. WE ARE FREE FROM MASTER SIN. Background: Paul begins with the promise that sin is no longer our Master. That is very important to understand. Sin was our Old Master but God has freed us from him. How did God do that? Not by killing Master Sin. He is still alive but God has killed/crucified us—the Old Man. Remember—2000 years ago when Jesus died for us, He not only died as our substitute, but He also died as your Representative. He died to represent our death in the family of Sin/the family of Adam. The only way we could come out of this family was to die. Jesus not only died for our sins but He also died our death for us. What does God expect from you? Listen to Romans 6:11, “Likewise you also, reckon yourselves to be dead indeed to sin, but alive to God in Christ Jesus our Lord.” All God wants you to do is to accept by faith that you are dead to sin and alive to God in Christ Jesus. Ask the Holy Spirit of God to open your eyes so you can see who you are in Christ. Application: You are no longer a slave to sin. You are no longer under the Law. You are free. You may not feel it; you may not understand it but you have it. The only way you will see your Old Man crucified is when you look to Christ. Keep your eyes on Christ and you will see the Old Man crucified with Christ. Take your eyes away from Christ and you will see your old self again. Start keeping a list and it will make things worse. II. WE ARE SLAVES OF RIGHTEOUSNESS. Background: What does it mean to obey from the heart that form of doctrine? Imagine there is a person here who is lost—does not know Christ. Somehow the gospel comes to this person—maybe through preaching; maybe through a friend; maybe through a bible study. This person is convicted that they are lost and Jesus is the Only Hope. Now he/she has a decision to make: What will I do with Jesus? When this person receives Christ as their Saviour, they obey from the heart. This is not half-obedience, partial-obedience. This is full obedience as to who Christ is; why He came; what He did for them. At the very moment, the Holy Spirit of God comes to dwell in that person. God makes that person’s spirit a new spirit and that person’s spirit becomes one with God’s spirit. As long as this new believer is obedient to the light that God has given to him/her, the Holy Spirit has access to flow through that life, body, and environment and reproduce the life of Jesus Christ. Why? Because that person obeyed from the heart. FIRST HANG-UP – Stealing. One day this new Christian is listening to a message like this one and the Holy Spirit convicts that heart that they should be giving their money to the Lord. Once you are saved, everything is now His. We are His slaves. By the way, it’s not 10%. It’s 100%. 10% is still living by the law. 100% is living by grace. Sadly most people in church this morning are barely tithing. As Manley Beasley would say, “God is gracious and he still uses fragmented light to send us fragmented truth and at least let us be fragmented Christians.” Nevertheless, most will never understand beyond the 10% and that’s that. You will hear a message like this where the pastor will say – “If you give your 10% to the Lord, He will turn around and give you back much much more. You can get by further on 90% than on 100%.” That does not make any sense mathematically or logically and the Devil will argue with you but that is the truth. But, you obey from the heart (just the way you obeyed from the heart that Jesus died for your sins and trusting in Him you can have eternal life) that form of doctrine and you begin to give. “Lord – I don’t know how we are going to make it but we are going to give and trust you.” You have freedom over stealing. Some people are legalistic and they tithe because they have to and there is no joy in giving. It’s all by obligation not obedience. But those who truly believe are set free and they become slaves of righteousness. Listen to verse 18 – And having been set free from sin, you became slaves of righteousness. Most people’s growth is grace is only so far and no more. Most people obey from the heart only two steps: get saved and stop stealing. Bible knowledge means nothing. SECOND HANG-UP – Smoking, dipping, and chewing. Now in a service like this the pastor is preaching and he is preaching on smoking or chewing or dipping. Two men get convicted. They are both convicted that they are abusing the temple of the Holy Spirit. Man #1 – He is convicted that he needs to stop. God did not give it to me and I need to try my best and quit it. But I am not going to go forward and put these cigarettes on the altar because if I don’t quit, I will make God look bad. He is really concerned about himself. God is perfectly capable of handling his reputation. We need to worry about ourselves. So he takes them home and puts them away; doesn’t tell anybody and makes a decision to stop smoking. He gets one of those small pocket Bibles and puts it where his pack of cigarettes would go. He gets a patch and gets a pack of gum and a bag of sunflower seeds and he works on them. When he gets around people at work, he wants cigarettes so bad, he cannot stand it. He is miserable. He has real will power. He may even quit but he still wants one. That’s religion but it’s not true Christianity. Man #2 – He is also convicted that he needs to stop. God did not give me this habit and I can’t handle it. I detest myself for using it. He comes to God and says “God unless you help me I can’t do it. Even as I am coming to you, I want one. You are going to have to help me. Sink or swim I am coming to you.” He obeys from the heart that form of doctrine to which you were delivered. He comes by the cross and by grace and falls before the Lord. Would you like to know what happens next? He gets around the same people who smoke and he does not even want one. Now Satan tempts him but the temptation is from the outside and not from the inside. No longer is he a slave of sin. That’s what obedience from the heart does. Man #1 did not dislike Jesus or reject Jesus but he decided to do it on his own and he shut the door to the Spirit of God and operated by the energy of his flesh. He forsook Jesus. This man will not grow in grace beyond that. He will grow in knowledge but not in grace. Spiritual knowledge means absolutely nothing. If it has not changed your character then it’s not growth in grace. Application: The moment you refuse to let Jesus have your problem, that’s the moment you begin to obey the flesh and you start on the road leading to death. THIRD HANG-UP: Uncontrollable Temper. This is one area where most Christians struggle with. They just cover it up real good. Why? Because they haven’t obeyed from the heart that form of doctrine to which they were delivered. For e.g. Manley Beasley would give this illustration – if I owned 40 acres of land and I decided to sell 39 acres and keep one. You could build a house as big as 39 acres but now I own one and you have to give me right of way to my property. I can come back and make him so miserable, confuse him, ridicule him, and defeat him. Satan does not care if we have given 39 acres to the Lord as long as he can keep 1 acre. He will let you do religious work (sing, bible study, serve) in church but beyond that you have a horrible temper and you act like the devil. The Devil has control over you. All he has to do is wait until he has you in the right place and then push the right button and you act like the Devil. This pastor at the new church was preaching the gospel and this same woman stood up in church and cursed in front of everyone. She embarrassed herself and everybody else. How did she do that? It started way back here. As long as we are properly related to Jesus by obedience, sweet water comes. If it is bitter water, somewhere back here we have switched fountains. Application: The only way to handle it is to go back and get our obedient back on track. Confess your sins and get right with Jesus.